Tone. The faithful Webster defines tone as “musical sound of a specific quality,” or better yet: “with respect to timbre and manner of expression”. We speak about tone all the time with respect to horn players, guitarists, bassists and many others, but not often do we hear “tone” in regard to drummers. 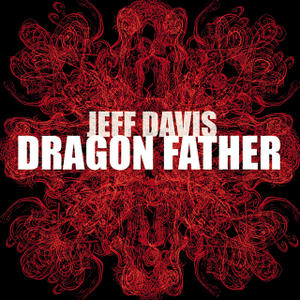 Jeff Davis is a drummer with tone, and it's a tone that belongs only to him. Give him any pickup drum kit to play and he immediately sounds like nothing else other than...Jeff Davis. Dragon Father is Davis' third release as a leader, and second for Jordi Pujol's remarkably consistent Fresh Sound New Talent imprint. The prior album, 2012's Leaf House, was a monumental piano trio recording with Russ Lossing and Eivind Opsvik, both of whom return here to form the rhythm section for this quintet, with the front line completed by cornettist Kirk Knuffke and Oscar Noriega on alto saxophone and bass clarinet. It's a cohesive group, and no wonder, given the amount of playing time they've had together in different combinations on many gigs and recordings. Davis, Knuffke, Opsvik and Lossing each have recordings as leaders that utilize at least one of the other members. Just a few highlights would be Knuffke's 2008 Clean Feed date Bigwig, with Davis, trombonist Brian Drye and bassist Reuben Radding; Opsvik's Overseas series of recordings (also on Fresh Sound, with Davis again, and an entire host of NY players); and several dates by pianist Jesse Stacken's trio...again with Opsvik and Davis. Oscar Noriega has been heard with his own band Play Party, which did a fine disc on OmniTone, and as a crucial member of Tim Berne's Snakeoil with two excellent albums on ECM. As on Leaf House all the compositions come from Davis' pen and he's a witty, erudite composer, not prone to showing off or wasting anything. Though the band is made up of five leader/composers everyone gives his all to the leader's compositions, and there is no clash of egos. Everyone has expert solo turns beginning with the opening "Dirt Farmer," Knuffke working seemingly backwards by starting with furious 16th note lines and then gaining space later, giving way to a strong solo by Lossing that ends with what is possibly the most dramatic flourish you'll hear all year, one which made me laugh hysterically with appreciation. Speaking of appreciation, more and more of it has been coming Russ Lossing's way in the last several years, and deservedly so. A serious, prolific writer (his own book boasts some 400 pieces), a gifted interpreter of others' music (see his solo piano disc of Paul Motian pieces, Drum Music), and a totally fearless improvisor, Lossing has become simply the best working pianist in New York, a city that's not hurting for pianists. I heard someone recently refer to the "busy cornettist about town, Kirk Knuffke," and is that ever true. In a few short years Knuffke has become ubiquitous on the New York scene. He's seemingly everywhere, and must have to turn down more work than other guys get in the first place. And no wonder. He has a tone that is perfection and is a witty and effective soloist in a wide variety of situations, and his work here is up to his usual standard of excellence. Oscar Noriega, on alto saxophone and bass clarinet, has somewhat of a lower profile but those in the know regarding the NY scene are aware of him as a tireless worker in many different contexts, from his own bassless quartet Play Party, to working with Berne's Snakeoil, with the band Endangered Blood (with Chris Speed, Trevor Dunn and Jim Black) and with vocalist Judi Silvano. He has a great round tone on alto, sometimes very fleetingly calling Braxton to mind, and is just as effective on clarinet and bass clarinet. Eivind Opsvik's lone solo turn on the date is used as a bridge between two sections of "Eli's Progress," a piece written for and named after Davis' son. Even with less solo space, the bassist is fully integrated into this music and just as invaluable to the whole as the others. Over the past fifteen years the transplanted Norwegian has become a first call New York bassist. The people he has not worked with could probably be counted on one hand, and he's a prolific leader in his own right, most often with his Overseas ensemble with Tony Malaby, Brandon Seabrook, Jacob Sacks and Kenny Wollesen. One of the smartest choices Davis makes with this release comes in the form of liner notes. Rather than having some high profile "critic" do the notes (which the artist has to pay dearly for, by the way) the leader has recruited his cohort, the excellent pianist Jesse Stacken. Not only is there the benefit of having a real live musician doing the notes, Stacken is one who has actually played the pieces heard on the disc. The pianist gives a thoughtful and intelligent track-by-track breakdown of the pieces here, which is why I'm not doing the same thing in this review...it's in better hands with him. Dragon Father was recorded live at The Cornelia Street Cafe in New York, an intimate listening room that regularly features some of the best programming in the city. The live sound as captured by Joseph Branciforte is immediate and realistic. Eivind Opsvik also handled mixing and mastering at his own Greenwood Underground Studio. In the liners Jesse Stacken speaks of the musicians of New York celebrating community, and of celebrating the scene. With this release Jeff Davis has done just that, and gotten it all right to boot. The playing (his own and the that of the band), the writing, the selection of bandmates, everything here is firing on the highest of levels. Dragon Father may just turn out to be the finest recorded example of small group New York jazz to be heard this year.